The Metabones Canon EF lens to Sony NEX Speed Booster essentially widens the image captured on Sony’s crop sensor and allows for more light to enter the camera. The glass inside the adapter focuses the image coming from the lens, making a smaller circle image and filling the crop sensor similarly to how the lens would normally fill a full frame sensor. Rental Includes: Back and front caps. Note: Not compatible with EF-s lenses or Full Frame cameras. 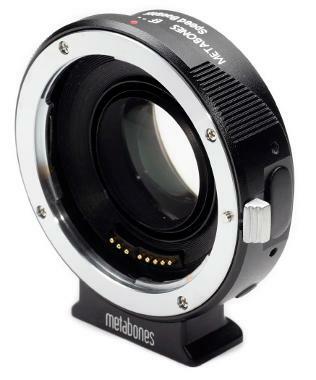 For a complete list of compatible items, please see this Metabones cheat sheet. • Increases maximum aperture by 1 stop. • Makes lens 0.71x "wider". • Electronic integration of aperture diaphragm, controlled by or from the camera body. • Partial autofocus support for late-model (post-2006) Canon-brand lenses. • Powered by camera body. No external power source required. • Tripod foot is detachable and compatible with Arca Swiss, Markins, Photo cam ball heads. • High performance 32-bit processor and efficient switched-mode power supply.